FREE Winter Comfort Recipes Cookbook, PLUS FREE “Holiday Survival Library” from Dr. Warren! Many of us are tired and frazzeled with last minute rushing and preparations for the holidays. We are scrambling to try to find time for healthy meals and snacks for ourselves in the midst of all this, how to stay as healthy as possible! We are also on the lookout for healthy and tasty - and simple - recipes and ideas to feed our family and friends as we gather together. Are you looking for a last minute gift, or a gift to yourself, to get a jumpstart BEFORE the New Year? has created book called “Winter Comfort Recipes”, full of tasty, simple, and healthy recipes which can be “scaled up or down” depending on the number of people eating at the time. Need simple, healthy, portable high protein snacks to get through the holidays? Power protein for breakfast and lunch? We can send them to you! Our two week “Fast Track” food gives you these (and you don’t have to use them all during the two weeks, you can spread the protein supplements over time if you choose.) Purchase the simple and affordable two week “survival supply” package, and we will also send you Dr. Warren’s Winter Comfort Recipes Cookbook for free! Dr. Warren has written over 90 articles herself, and has been featured in numerous magazines for her advice as a medical weight loss expert. Here is a collection of her posts addressing the challenges we face through the holidays, and over the winter - we’ve included the links to make it easy to find them! You can also call us any time for personal help. 7 Tips to Survive the Holidays! You can have personal, private, individualized consultations with Dr. Warren and her team of warm, caring professionals at Physicians Healthy Weight Center in her offices in North Hampton and Dover NH. For those who prefer, or are unable to visit our program in New Hampshire, we are now able to offer customized nutrition and lifestyle assistance via email, phone, or Skype. Read more about our program at: healthyweightcenter.com, and call any time: (603) 379-6500. As New Hampshire's most comprehensive non-surgical medical weight management center, we offer an individualized program to help you achieve real and lasting success. Dr. Jennifer Warren is a graduate of Tufts University School of Medicine, a diplomate of the American Board of Family Medicine, and is a diplomate of the American Board of Obesity Medicine. After completing advanced training in medical weight management, Dr. Warren developed her comprehensive program, and founded Physicians Healthy Weight Center in 2004. Since then, she has helped patients lose tens of thousands of pounds. Dr. Warren lectures to other physicians locally and nationally on weight management, and has volunteered in the development of programs to combat childhood obesity, serving on the obesity expert panel of the NH Foundation for Healthy Communities, and HEAL (Healthy Eating Active Living). 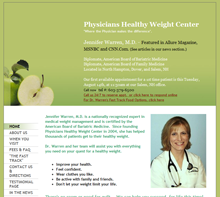 Dr. Warren has been featured as a medical weight management expert in both local and national media outlets. She is a frequent contributing medical expert for Allure magazine, Women's Health magazine, and has been a lecturer for WebMD University. Dr. Warren also co-hosted her own radio show, "Healthy Weight Talk" on WGIR in Manchester. Pat is a board certified Nurse Practitioner, with 30 years experience in the nursing field, with a focus on healthy lifestyle coaching. Pat has been personally trained by Dr. Warren on all phases of the Healthy Weight program, and works closely with Dr. Warren. Patients are extremely appreciative of her thorough, careful approach, and warm support. Beth studied nutrition at Keene State College, and has extensive experience developing nutrition education materials. Beth is particularly talented in "translating" healthy nutrition principles andguidelines into practical, realistic, eating plans. Whether you are challenged by a busy lifestyle,frequent travel, long work hours, stress, or medical issues, Beth is an expert at problem solving for real life success. Cara is a graduate of George Washington University and The University of Hawaii where she earned a Bachelor of Science in Food Science and Human Nutrition, Dietetics. Cara did her dietetic internship at the University of Nevada, where she worked as a clinical registered dietitian in both small and large hospitals. She also worked in a community health center in Hawaii, where Cara was the primary dietitian, counseling patients on everything from diabetes to obesity. Cara's experience and dedication to nutrition make her a great addition to PHWC patients by guiding and developing their personalized lifestyle plans, regardless of their previous nutritional knowledge. Our nutritionist Beth's Favorite Tips for Weight Management through the Holidays! Watch out for excess calories in alcoholic beverages. Going to someone’s home for the holidays? Bring a veggie platter or fruit platter, or maybe shrimp cocktail. Stay away from dips. Don’t eat the pie crust and say no to the whip cream. Keep your body properly hydrated. Skip the juice and soda and opt for water. Substitute skim milk for whole, and non-fat sour cream or greek yogurt for dips. Use chopped vegetables instead of butter or sausage to moisten stuffing (cook outside the bird). Include steamed veggies at holiday meals. Your guests will appreciate your healthier choice of steaming instead of baking them in sauce or cheese. Try a broccoli or brussel sprout bake. Buy plastic containers-give your guests the high calorie foods so you won’t be tempted later on. Use unsweetened cocoa powder for unsweetened baking chocolate. Sorbet instead of premium ice cream. Soy chips instead of potato chips. Non fat mayo or laughing cow cheese wedges for regular mayo. Sneaky ways to reduce calories in your foods. Lite or non-fat cheese for regular full fat cheese. Leave the frosting off the cake and sprinkle confectioner’s sugar on top instead. A light sprinkle over cakes and brownies significantly cuts calories and fat compared to having frosting. Add more cinnamon, nutmeg, ground cloves or ginger to recipes that call for these spices and decrease the amount of sugar the recipe calls for. Toast nuts before mixing them into batter or dough and decrease the amount needed in the recipe. Toasted nuts have a stronger flavor so you can use less. Beth Almstrom studied nutrition at Keene State College, and has extensive experience developing nutrition education materials. She is known for her unique talent in "translating" nutrition principles and guidelines into practical, realistic eating plans. Whether you are challenged by a busy lifestyle, frequent travel, long work hours, stress, or medical issues, Beth is the expert who can help with problem solving, for real life success. Portion Distortion, Serving Size, and Weight Control: Scale Down Calorie-dense Foods, But Scale UP Healthy Veggies! "Portion distortion" - bigger isn't always better! Most of us are aware that serving sizes of food and drink have ballooned over the last few decades - right along with ballooning rates of obesity, metabolic syndrome, fatty liver, type 2 diabetes, and other health problems related to excess weight. Here is the problem: on one hand Americans tend to have over-sized servings of unhealthy food...but on the other hand, we have under-sized servings of healthy vegetables, and fruit! Research confirms our suspicions that we tend to consume more when we are served larger portions of food and drink. We also tend to eat larger portions when we use larger plates, forks, spoons, and drinking glasses. We serve ourselves more, and then eat more per bite. The latest research published in the British Medical Journal states that eliminating oversized portions could reduce calorie intake by 12-16% in the United Kingdom, and 22-29% in the United States. That is a pretty impressive improvement by simply using smaller plates, utensils, and having smaller portions served to us. But here is the problem - we have to be VERY careful with the message about portion control. Some people have gotten the idea that we should cut down portions of ALL types of food. I don't know about you, but I have never met anyone who was eating too much broccoli, or too many healthy salad greens. I shared the research on Facebook earlier today, and a very successful, healthy patient of ours made the following comment: "Been doing this trick for several years now. My dinner plate is 7 inches and my salad bowl, which I lovingly refer to as my feeding trough, is quart-size!" Bingo, we have a winner here! This strategy helps down-size the calories, while up-sizing the nutrition! And now, a quick update on our American Viking Diet. For those who don't know, we are working on a book - and a series of cooking videos - featuring the healthy Nordic Diet (which has been studied in Scandinavia for over 10 years, and has health benefits similar to the Mediterranean diet.) We are adapting the European version to our American foods and tastes - and we'll show you simple, healthy recipes using locally available, seasonal foods! I'm working with fabulous cook Melissa Clifford of Sweet Melissa's in Dover, and we've already filmed two recipes...we'll let you know when we're done with editing, and have them online. We hope to have the book out this spring, but will get you sneak peaks at the recipes even earlier!